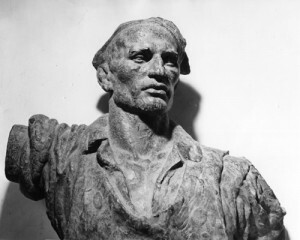 Lojze Dolinar is one of the central representatives of the 20th Century Slovenian sculptors. He was born in 1893 in Ljubljana. His early sculptures are in the style of academic realism, symbolism, secession, and were created in the spirit of the picturesque, impressionistic and new-baroque modulation, while he also approached expressionism. After a short stay in the USA in 1920 he turned his attention to architectural plastic art in which he followed both antique as well as modern models. Orders for architectural plastic art led to his move to Belgrade in 1931. In the period between the two World Wars he was one of the most sought after monument sculptors, creating among others, the tombstone of Dr. Janez Evangelist Krek, two Calvary monuments in Ljubljana, and the monument of fallen student-soldiers in Skopje. In 1946 he joined the Belgrade Fine Arts Academy, gaining a professorship in 1949, where he specialised in the design of the monumental, slightly modernised and fully plastic human figure depicted in the act of performing heroic gestures. After World War II, new orders followed. His last great sculpture was the Revolution Monument in Kranj, where he lived after he had retired. In 1966, the lower and upper hall of the Kranj City Hall were adorned with graphic and plastic pieces of art which Dolinar donated to the Kranj municipality.